“I took two hundred drawing to Ali Imam and asked him to pick 100, which he thought were the best. He chose one hundred works on paper. Then I asked him to get me some container – an ordinary empty bottle. He brought one; I burned those hundred drawings, which he thought were the best, and collected ash in the bottle. This I called the essence of art, a kushta, from which everybody could take one or two dozes”. This and other anecdotes describe the art, life and ideas of Iqbal Geoffrey. Even though it is the work of an artist, that reveals his concepts and personality, but in the example of Geoffrey, his words hold much importance. In fact not only his words, but his acts also describe the unusual approach that is visible in his art. In his case, one can not distance, distinguish or discriminate life and art. His art is a reflection of his life and vice versa. Trained as a Lawyer and known as a visual artist since sixties Iqbal Geoffrey lives and works in Lahore. But his means of working and way of living can not be defined as normal or ordinary. Actually artists are known for their uncommon patterns of existence. Often they can not be grouped into usual contingent of a society, as they stand apart from other, predictable, acceptable (and useful) sections of society. Several artists spend their lives in struggling to be recognized as the indispensable fraction of society. However a public bogged down by beliefs, norms, customs, habits and conditioning has been reluctant to realize the genius of a number of creative personalities. In their age, artists like Van Gogh, Gauguin and others strived to become part of a social circle, but were unsuccessful in their life times – only to emerge as artistic celebrities later! The frequent failure in the smooth relationship between artist and his/her society results in a body of work, that indicates a voice of rebellion as well as reveals an urge to be acknowledged. Hence the artist’s personality is composed of two – contradictory elements. He is simultaneously in love with his surroundings – and one can also detect an element of hate in his creations. Actually, it is not the hate, but a means to sabotage and question the prevailing notions and practices of a discipline or a set of ideas/ideologies. Artists through their creative outputs puncture, deconstruct, discredit or disgrace norms, which pose problem for many who are used to the comfort of habit – in life, literature and art. Examples like V. S. Naipaul and Salman Rushdie are a few who have been questioning their subjects, audience and times through their creations. Interestingly, the two authors are displaced figures, belonging to various worlds (India, Caribbean, Pakistan and England) at the same time. The writings of these two also deal with the migration – of body, but more than that, of mind that affects a man of modern epoch in multiple ways. Rushdie has resolved this issue by negating a permanent home, and stating that a writer’s home is his language. If translated into art, than according to Rushdie, the artist’s place of residence is his art. All the rest is just points of exile. A visual artist moves across geography, parts of a town, cities, countries and continents, but each location brings out a dissatisfaction and frustration. Each place of embarkation causes a nostalgic fervour and flavour for the situations that have been experienced and increase the yearnings for the destinies yet to come. Hence artist functions as a form of revolt and acts like a rebellious individual. If one believes in the definition of tradition as described by Ranjit Hoskote (the Indian poet) then there is no one as homeless as Iqbal Geoffrey today in the art of Pakistan. In our society, like many other third world countries, not only the artists but writers, musicians and intellectuals face a dilemma or displacement while trying to live in traditional societies in the Post Modern era. For many the question of tradition poses a grave problem, while modernity generates a great deal of confusion. Often this situation is dealt by maintaining equilibrium of Tradition and Modernity, East and West, Local and Foreign. So in most of their works, if on the one hand the heritage is highlighted; at the same instance Modernity – the achievements of the West, is admired, acquired and assimilated. Iqbal Geoffrey addresses the issue of East and West (within us and outside) in his ‘usual uncanny’ way: By adapting a name that not only suggests him – as an individual, but signifies the fabric of our present day society, which is a blend of Eastern as well as Western elements. Geoffrey’s adaptation of his surname – a twist on regular family name Jafri represents his complete personality – Iqbal from the East and Geoffrey of the West. 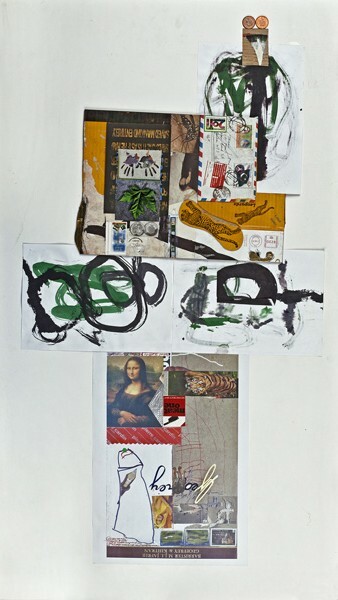 This way of changing familiar material in order to create unique entities, is reflected in his art too, in which diverse and contradictory components are combined in order to construct a single – but extremely comprehensive and compelling pictorial. Some years ago, in an interview, when asked about the need for a painter to develop a personal style, Iqbal Geoffrey, in his natural way refutes to have this as a necessary feature, because ‘you can always turn the canvas and see the name of the artist, so what is the need to have a style’. Yet in his own work, the presence of a style is unmistakable. Interestingly, as Iqbal Geoffrey did not study at an art school at his homeland, he was not inspired from a particular painter, nor his work influenced a large number of younger generations. In the art world he stands as the sole genius, often misunderstood, yet alone and aloof. His studio that consists of his lawyer’s office in a busy square of Lahore and his bedroom in Gulberg, are actually extensions and reflections of his mind, that keeps on shaping works and images during his walk in the city. Yet if examined, one may be able to deduct some traces of art in his art. American abstract painters, Antonio Tapies and several others can be found, but these are reminded due to their superficial similarities, since in his conceptual quest Geoffrey can not be classified with any other artist. His ideas are unique and so is his vocabulary because it keeps on transforming its appearance and sensibility. Geoffrey’s status in Pakistani art is undoubtedly peculiar. In his personality and art, he offers the vision of Other to the art establishment, yet his contribution towards the development of art and ideas in Pakistan is pertinent and profound. His work, once it became more known in his homeland has inspired a number of young artists, who may not work in the same diction, but their way of thinking has been altered and so are their practices. Although their works do not betray a direct connection with the art of Geoffrey, yet the uncanny approach in their creative practices is a mark of his presence. This recognition is important not for Iqbal Geoffrey, but art in general, because in his personality, the art of Pakistan projects a façade that is unseen and unexpected. The existence of Iqbal Geoffrey is significant in Pakistani art, because he represents the personality of a painter, who is not slave to a style. In our midst, style is often perceived as a label and brand mark. Something essential to develop and cash an artist in the art market. Usually a painter evolves a specific style, with personal features and then keeps on re-producing the similar sort of art works, to ensure his commercial value. It has been observed that many great names of Pakistani art are manufacturing their works, which meet the demands of the gallery and the expectations of buyers. This kind of pressure bars them to experiment in something new or abandon their past practices, which results in repeating their ‘successful’ style in a miserable fashion with the passage of time. No such restrains are attached to Geoffrey, because he does not believe in the tyranny of a style or even in the superiority of an art market. He defies these traps for an artist, and moves beyond the market attractions. Thus one finds him walking from his office to his work place, carrying a bag that contains his papers (both the legal applications and art works – if two can be separated!). The humble and content manner of his life is a unique phenomenon of our times, especially in the ever growing and increasingly pompous art arena. He offers the model and example of an artist, who can survive on minimal resources and is more content by serving his cause. Actually it is his cause that can be defined as his style. The cause is to support the wretched of the earth. Ordinary citizens who can not afford a legal aid, or political victims, who are unable to find their defender in civil courts. Geoffrey provides his services, free of cost, because for him this is art. How can art be disjointed from life, because both are attributes of God. Geoffrey claims that God is an artist and a lawyer and so the world created by him is just and beautiful. Explaining the relationship of beauty to just, Umberto Eco (in his book On Beauty) recalls that the Greeks of fifth century B. C. did not have a separate term for beauty; for them what was just was beautiful. So if one accepts this definition, to be a lawyer and makers of aesthetic images is not in contrast or conflict to each other. Geoffrey in his long career of a barrister and artist fought battles for just on many frontiers, but mainly, it is his art that still astonishes the generations to come. 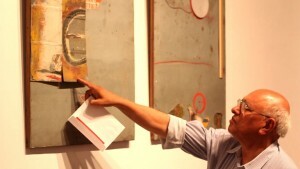 Even though he refused to collect, accumulate or preserve his art. During the sixties when he was part of a residency in the US, as recalled by one of his contemporary painter, on the last day, Geoffrey arrived on his scooter, put all his canvases in the middle of courtyard, and set everything on fire. The fire for him is a substance that purifies everything, even the soul of man and his art. Iqbal Geoffrey narrated that while he was in Karachi he used to burn two of his drawings everyday. Once he did not have any of his own work, so instead, he put two sketches of Sadequain to fire. This activity can be considered as the instinct of mythological bird phoenix, which burns itself and is reborn from its ashes.